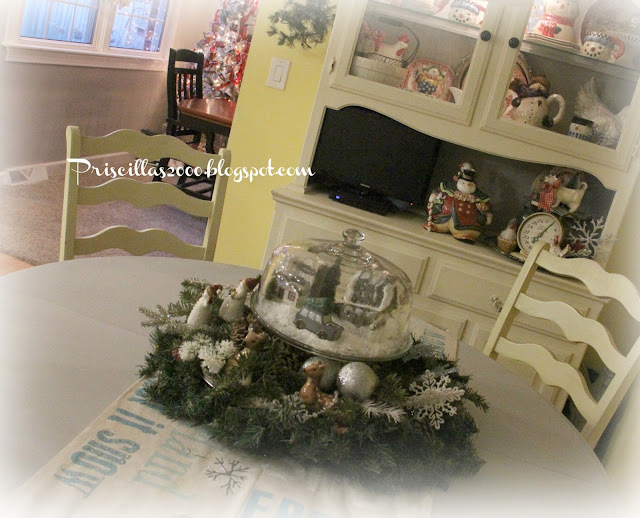 Priscillas: A New Kitchen Table! So ..I didn't get an new table but it sure looks like one! I decided to paint it grey ..
we usually make homemade chalk paint with plaster of Paris but I saw this Rust-o-leum paint at Home Depot and it was pretty inexpensive..and I wanted to give it a try.. It worked great ..my daughter came over yesterday to help me paint and she ended up painting the whole thing herself because the little grandsons were over so I watched them while she painted. here is the table in all its oak glory .. just wasn't loving it! I should have painted the table 2 years ago when I got it ..such a difference it made! 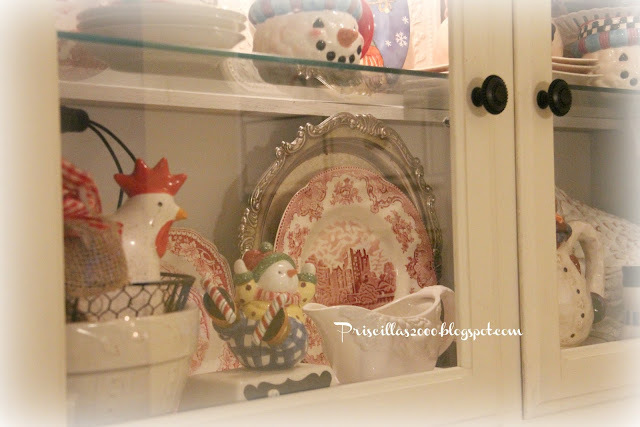 When I painted the hutch I painted the inside ( that is a mirror in the back with chalk paint on it) grey ..so that's why I did the table in grey. 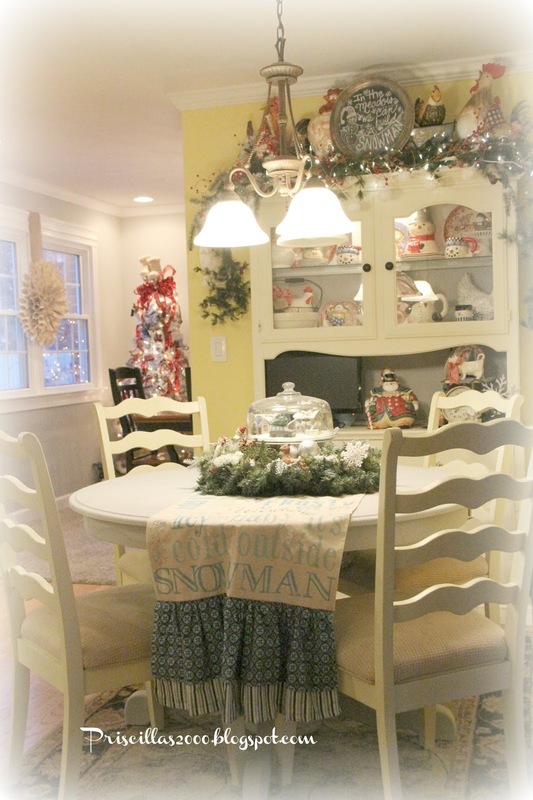 The ice skate tree ( in the dining room) and the snowman tree in the family room are going to be coming down this week .. I am sure going to miss those happy white lights! It has been so gloomy here ! So I am now loving my Craig's list table .. 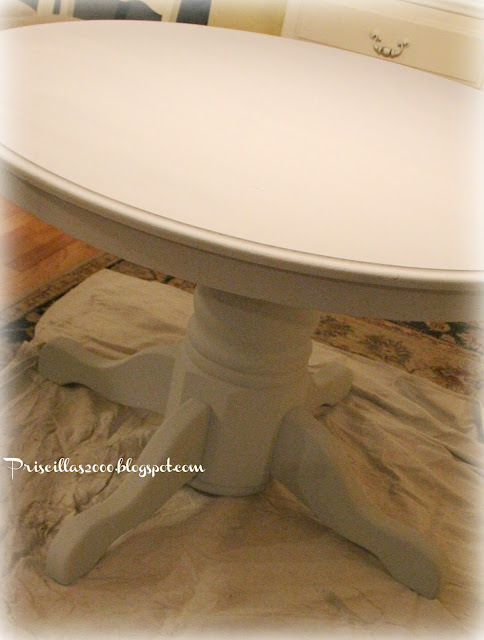 I still want to distress it a little and add some dark wax especially to the pedestal.. Thanks so much for coming by to see my "new" table! Oh wow you are inspiring me to paint mine. I did not know Rustoleum made the chalk paint. Yours came out awesome! It looks great, Priscilla. 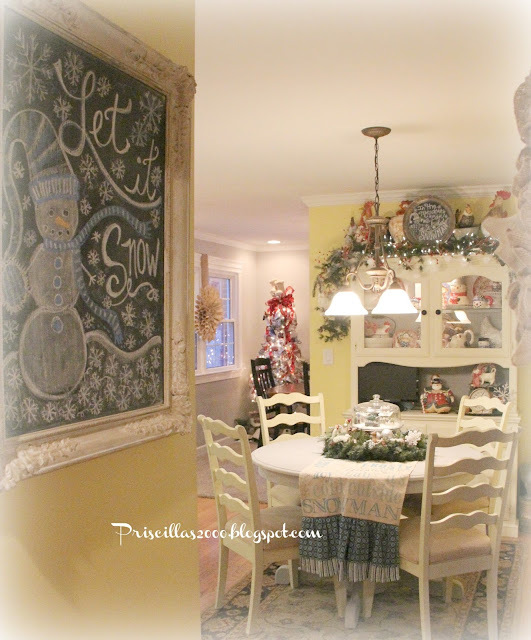 Thanks for the heads up about the Rustoleum chalk paint! It looks pretty. 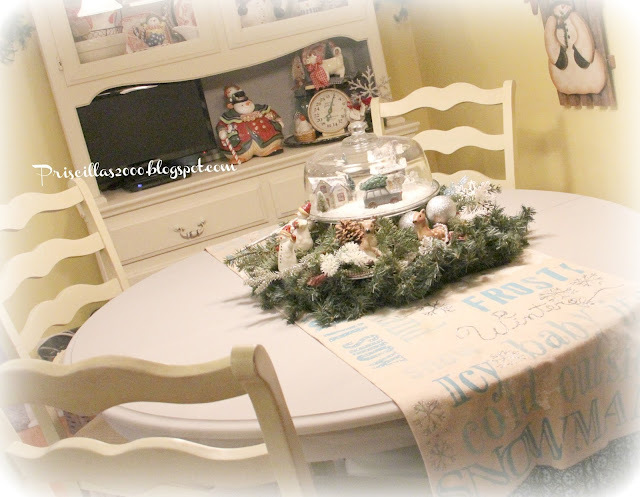 That is one thing Hubby will not let me paint and it is the dining room table and chairs. I really wished he would let me, but we comprimise on other things. Well, it's just beautiful. Well done!....and well done to your daughter too! Love it! I like it a lot ! Great job! The "new" table looks wonderful! Wow, what a fun blog to read! 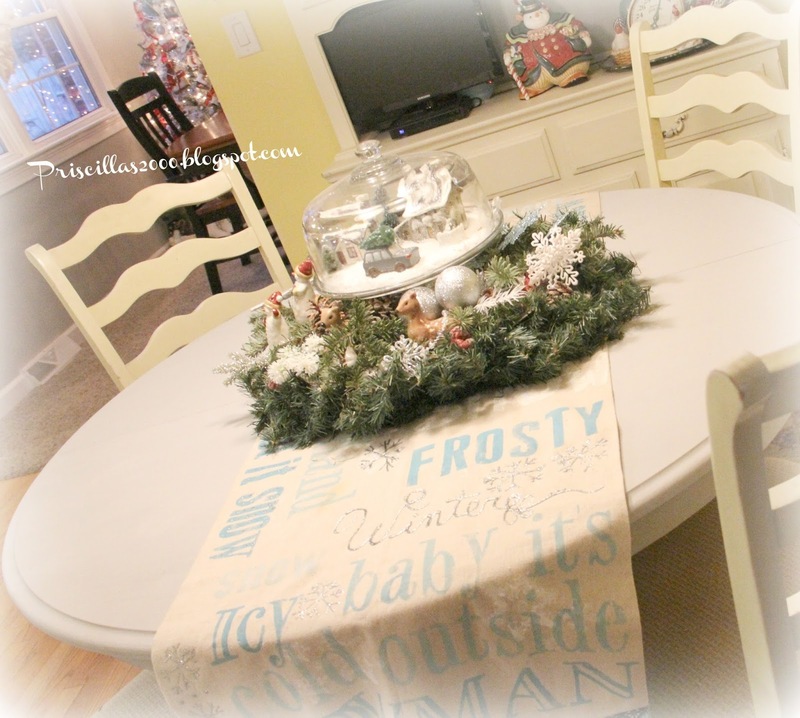 Love how your table came out and the color that you chose!! 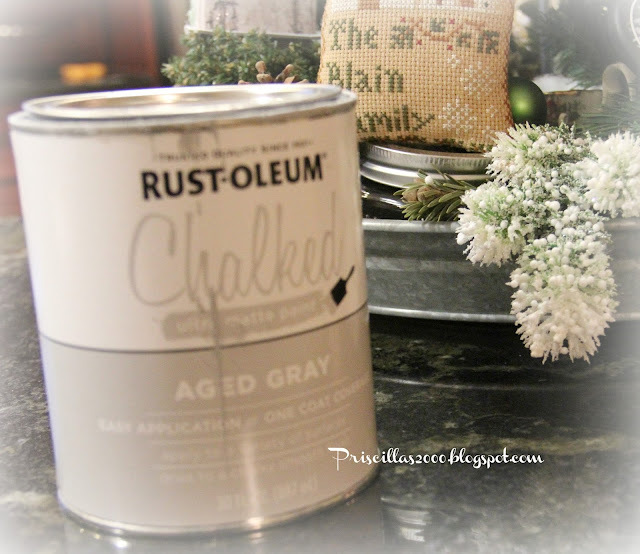 I am thrilled to find out that Rustoleum makes Cahlk paint!! 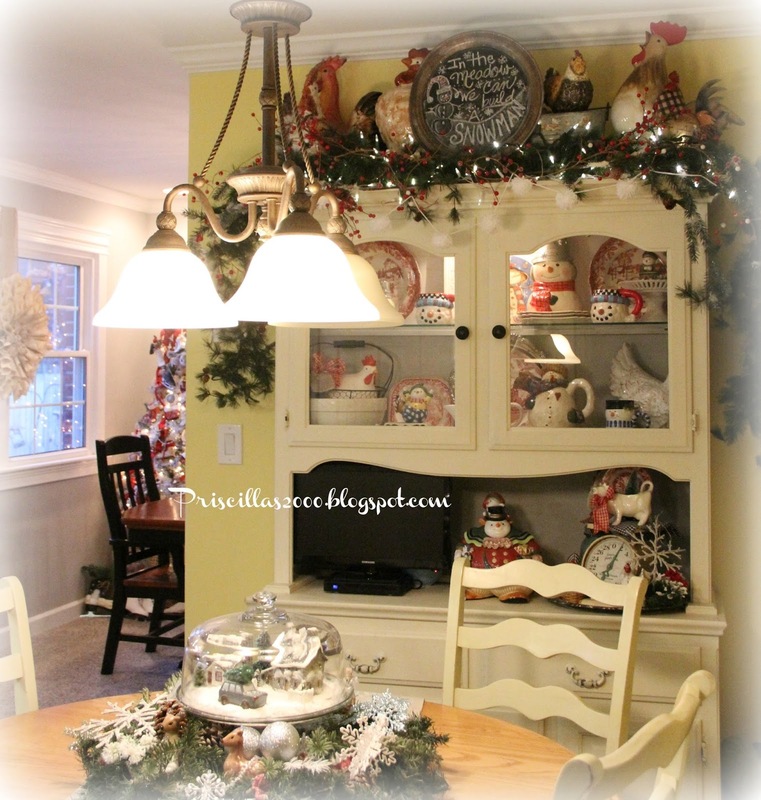 I will look into that when I am ready to paint my bedroom furniture in the Spring! !